A bright split level first floor flat arranged over the top floor of this attractive semi detached period house. The bay fronted reception room is impressive and enjoys the full width of the building, and a generous double bedroom is situated at the rear of the flat. Both the eat-in kitchen and newly fitted bathroom are well equipped and the flat generally offers perfect space for a couple, or those looking for a superior finish with a spacious airy feel. Located quietly and surrounded by similar attractive villas, the southern end of St Elmo Road is particularly sought after and runs west off the upper end of Askew Road. It is within easy reach of Ravenscourt Park and Shepherd's Bush Market tubes, and minutes from local bus routes which give ease of access to Hammersmith Broadway, Westfield and The Central Line tube and mainline stations. Askew Road has a large and ever improving range of local shops and cafes to make life easy. 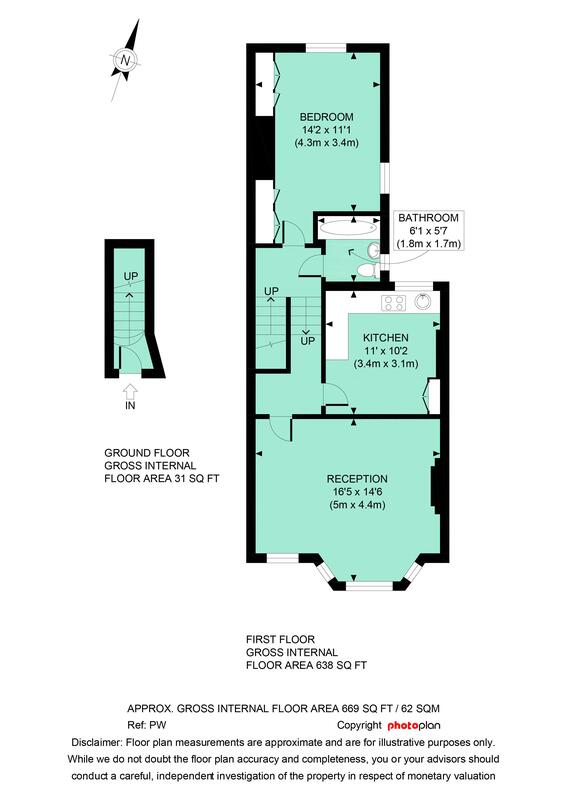 669 sq ft / 62 sq m approx.